Not currently on our shelves, but available in 1-3 days. Bestselling author Steven Gaines's "richly entertaining" (People) and juicy social history of the Hamptons. As one of America's most fabled communities--long a magnet for artists, celebrities, the very rich, and their respective hangers-on--the Hamptons have been a scene of constant collision among the established old guard, New Money, and the local families who farmed and fished the region for generations. In serving up three centuries of Hamptons history, Steven Gaines introduces a host of colorful characters including Jackson Pollock, Ron Perelman, Lauren Bacall, and the Bouvier Beales of Grey Gardens infamy. 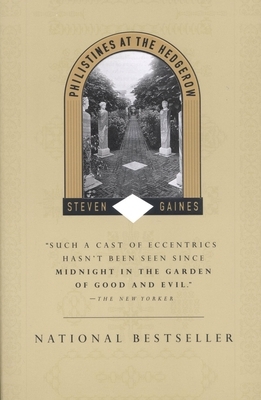 Philistines at the Hedgerow is a mesmerizing feat of storytelling--a book that takes us behind the privet hedges and rolling sand dunes and brings vivid life to the curious passions and personalities that animate the Hamptons. Buy a Carmichael's gift card! Digital Audiobooks - Buy Local!